Physical security is often still the most effective measure to protect an area, particularly when it comes to residential estates where there may be a high volume of foot and vehicle traffic at all times of the day and night. Security guards are an indispensible part of a physical security strategy, but as always, when it comes to the human element, they can cause more harm by not doing their jobs properly than if they weren’t around at all. When a breach does happen, the easy way out is often to blame a guard rather than investigate whether there were other reasons for a lack of security. This can be easy to do if there is no way to determine if guards were where they were supposed to be or whether they were slacking off. Guard monitoring technologies have become an essential tool to ‘watch the watchers’, as well as the converse: to protect guards from spurious accusations by residents or estate management that they weren’t doing their job. Hi-Tech Security Solutions asked three leading providers of guard monitoring technologies to share their thoughts on some of the challenges, and their particular solutions. “During the past four years of being in the guard monitoring business, we have serviced customers of various sizes, ranging from as few as five up to as many as three thousand security officers,” says Active Track’s Casey de Villiers. “However, regardless of the size, all customers are faced with the challenge of personnel management. 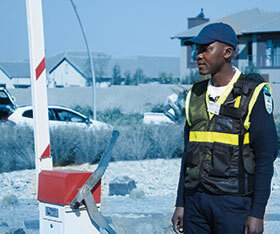 Active Track specialises in workforce management solutions for South Africa’s residential and industrial sectors. One of its key guard monitoring products is the Active Track, an RFID, GSM and GPS enabled, handheld guard monitoring device. Through its GPS functionality, it enables the tracking of movements of security officers, while the GSM capability allows for the triggering of panic and distress functions in an emergency situation, and two-way communication with security officers. The resilient design of the Active Track, being waterproof and tamper-proof, with a battery life of up to 72 hours, ensures that it can withstand the unpredictable environment of residential estates. The unit can be tracked by estate management and security service providers, remotely and in real-time via Active View, an online portal which monitors and records the movements and events of each Active Track device. A dedicated 24-hour support centre also has access to Active View, and is suitably trained to monitor the movements of Active Track devices, and assist both security officers and management in emergency and panic situations. To ensure that duties are carried out correctly, site-specific parameters can be set to generate alarm conditions when breached. Alarm conditions are communicated to management by way of SMS and/or email, and the call centre via an alarm. This equips one to respond appropriately – whether this is the support centre calling the device to determine why a patrol was missed, or a response unit being deployed to site where an RFID tag was scanned under duress. Active Track comes with a workforce management system, and can also be integrated into other management platforms. The patrol records of every security officer, and all events and alarms generated, are recorded and stored on Active View, the cloud-based support software. From this data, automated reports are generated and made available on a daily basis. At a glance, one can determine which security officers are failing to carry out their duties correctly, or at all, and take the appropriate disciplinary action. This results in improved performance overall, and increased accountability. BetaTrac has created a guarding management solution called AIMSS (Analytical Intelligent Mobile Security System). It is built around a device called eGuard, which is body-worn on the left arm, out of harm’s way and allowing the guard to have full use of both hands. eGuard operates continuously by replacing the battery every 24 hours, and reports the guard’s movement and conditions every 30 seconds. Data is collected by the back-end and measured against many conditions, such as correct patrol routes via GPS, no movement, stop/start of patrols, reaching checkpoints, time taken to reach checkpoints, how many cycles as per schedule, as well as others. AIMSS is fully autonomous, producing daily performance reports, detailed reports and off line status reports. The system has a three tier matrix escalation, ensuring that all relevant people will be notified when an alert is triggered. For example, in the first hour an alert will be sent to assigned supervisors or a control room, and if not attended to within an hour, it is escalated to an operation manager. Reports are generated automatically for senior management to see how the process was managed. “There are zero excuses as we supply an abundance of data to make sure the whole team is aware of status conditions,” says Lawrence. AIMSS is supplied with a control room software platform which is SQL database driven, enabling integration into other systems if necessary. BetaTrac has also developed a web-based live viewing platform with OTP (one-time PIN) access for senior management to view and analyse live situations, as well as an Android smartphone app for easy, accurate setup of all guard route patrols. Econz Wireless identifies major challenges as being guards’ attempts to sleep instead of guarding, or being at the wrong place. It offers the Timecard GPS, Timecard Lite and Eservices solutions, which use GPS and job tracking within a given area, or according to a job dispatched. By providing real-time alerts and tracking, time sheets are eliminated with clock-in/out, breadcrumb tracking, etc. Econz Timecard GPS and Timecard Lite may be used for one or more guards, and the location can be smart fenced to ensure attendance on site, or at the correct positions at predetermined times. Features available include clock-in lock, pre-determined clock-in times and locations, all which can be seen from the control room. Once a smart fence is predetermined, if the guard strays outside of that virtual fence it will be shown at the call centre or supervisors' devices via an alert so action will be taken. Similarly, if the guard has not moved for a preset length of time, an alert will be sent to the call centre or supervisor, as well as the guard. Their locations are tracked using GPS technology and automatic checks on location, breadcrumb trails, etc. can all be preset. Econz provides a full workforce management system in the form of Eservices, which does everything from simple tracking to job alerts, reports, signature and/or photo sign off, inventory for parts, and alerts so that supervisors can check job management, breadcrumb trails and timesheet clock-in/out. The solutions may be fully integrated with existing payroll, job and workforce management and time and attendance systems.